Ericka Beckman, Cinderella Game 1–4, 2015, four C-prints, overall 32 × 40". Ericka Beckman’s Cinderella, 1986, a 16-mm rendering of the fairy tale, is an Atari-like musical in which the title character staggers through various levels of narrative as if in a video game. As the centerpiece of a spellbinding exhibition, this rarely screened film demonstrated the staying power of Beckman’s work thirty years on. Mostly employing the artist’s signature palette of bold primary colors against black backgrounds, the stylized film resembles the classic tale only insofar as a female protagonist is put through the wringer of some odd gender socialization: Cinderella toils at an inferno of a hearth and is taunted by the whistle of an abstracted blue clock tower (and by an accordion-wielding companion played by Mike Kelley, a previous collaborator and performer in Beckman’s oeuvre). She is transformed from dull laborer to post-punk princess in neon green and taffeta; she becomes a digital avatar fabricated on an assembly line; she dances with a prince. The work is anxious and hyperactive, allegorical and arcane. Like so many of Beckman’s filmssuch as You the Better, 1983, and Hiatus, 1999Cinderella is structured around the premise of an abstruse game, whose interface is a combination of live-action footage, early computer graphics, stop-motion animation, and in-camera effects. Not surprisingly, her techno-futuristic films from this period ingest the look of arcade video games of the time while retaining traces of 1970s structuralist filmmaking, here infused with the moodiness of 1980s No Wave cinema. Images hover between object and pixel. Furthering the notion of real versus imagined spaces, the show included a sculptural set piecea bucket suspended on a pulley system, hovering over cartoonlike anvil and mallets, which appear in the filmdramatically lit and situated in proximity to the projection. Like a Disneyland attraction, the sculpture, titled The Forge Bucket and Chain Prop, 1986, became a real-life cartoon, a theatrical proposition that asked the viewer to take a leap into the imaginary space of the artwork. 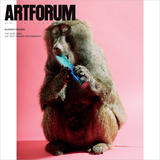 Beckman’s shifts between various types of representational spacedigital versus real, sculptural versus filmiccarried into two related photo works and a series of four drawings also included in this show. 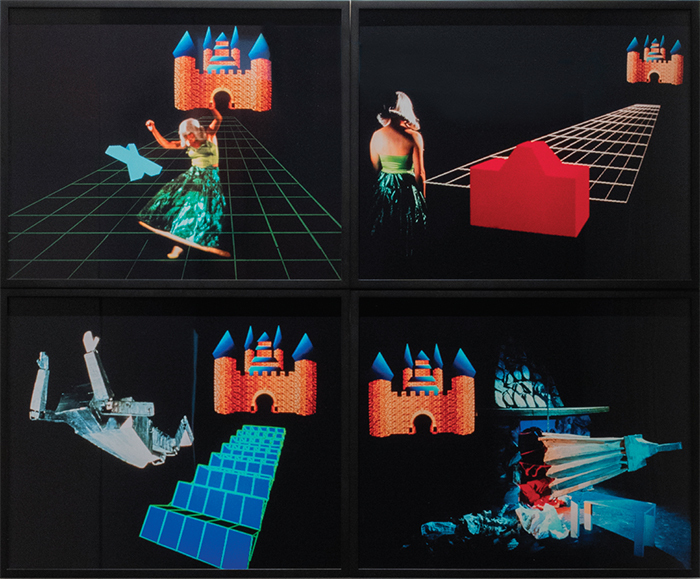 The composite print Cinderella Game 1–4, 2015, which was modeled on preparatory sketches made for the film, is a four-part color photograph that evokes both film stills and graphic renderings: the real-life Cinderella and her various obstaclesthe hearth, a castle, a floating x, a puppetlike robothover over the graphic lines of a Tron-like void. The charcoal, graphite, and pastel drawings, on the other hand, read like wild comic-book illustrations or animation cells. Not unrelated to the Pictures generation’s reuse of mass media, Beckman’s approach synthesized the look of popular entertainment with innovative editing techniques of her own design. Video art from the early 1980swhich indiscriminately employed then-new digital editing toolscan look dated today, yet Beckman’s work holds up. This exhibitionand those recently presented by the artist at Mary Boone Gallery in New Yorkoffered an education to a younger generation of artists working through the conditions of the digital age.